The woeful run of form attributed to the Tamil Thalaivas in their home leg of the Pro Kabaddi League season six continued as the Bengal Warriors, playing their first game of this season dominated over the hosts to secure a 36-27 win over the Ajay Thakur-led side at the Jawaharlal Nehru Indoor Stadium in Chennai. 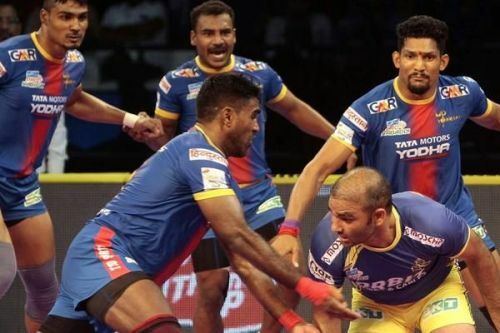 In what turned out to be their fourth loss in a row from five matches, the Thalaivas had their moments but failed to convert them into a result in their favor as at the final whistle, the visitors were the jubilant lot on the mat. The encounter was marked by two incidents that happened for the first time this season - Ajay Thakur could not find his feet while Jasvir Singh, who had just 7 points from 3 matches dug deep to find his rhythm as he finished with 7 points. Jasvir Singh started things smoothly as he picked two points at the start to enable the Thalaivas to take a 10-7 lead in the first few minutes. However, a Rakesh Narwal super raid levelled scores was followed by an all-out on the Thalaivas only minutes later as the Warriors raced into a lead, from which there seemed to be no path of return for the Thalaivas. Here are the player ratings from both sides. For the first time this season, Ajay Thakur looked a pale shadow of himself, failing to be amongst the points as he finished with just 6 points from 14 raids and also failed to lead his team to a win. The veteran raider was in his element from the start of the game and kept the Thalaivas in the hunt for a majority of the opening half before a set of tackles, three from himself helped Bengal gain the lead. Manjeet Chhillar had a relatively quiet game by his lofty standards but still managed to pick five points, 2 through a couple of raids and three tackle points, including a vital super tackle in the final moments of the game. The youngster, who has had a moderate run this season was not utilised too much with Jasvir finding form as he was often summoned only for crunch situations. From 8 raids, Athul picked up 4 points but was a little too hasty in a few tackles that he put in. Left corner defender Sunil Kumar was given a start in this game but it was a chance to shine which went begging as the veteran defender found defending hard against the likes of Maninder Singh and Jang Kun Lee. For the second time in a row, Amit Hooda has ha an off-day on the right corner as he could pick just one point from four tackles with his famous dashes and ankle holds failing to keep the Bengal raiders at bay. Starting ahead of C Arun, Darshan's unyielding form hurt the Thalaivas as the youngster failed to notch up a single point and instead gave away points on his unsuccessful tackles. Finding himself on the bench for the first time this season, C Arun was summoned on to the mat but did not make any impact of sorts, with just the one point to show from 2 tackles. Vimal Raj V was yet again thrown to the defensive unit on a DO OR DIE raid in which he could not bring home a point.